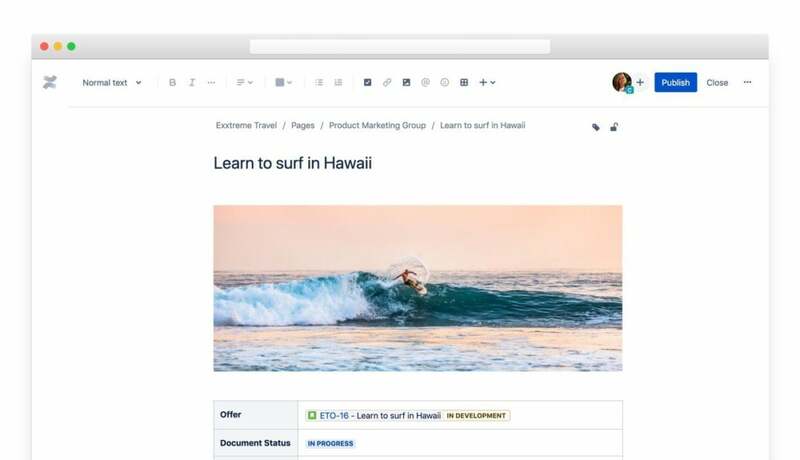 Atlassian has given Confluence its biggest revamp in years, offering more powerful analytics, improved search and new ways to interact with the content collaboration platform. Alongside the 15 new Confluence features unveiled at the Atlassian Summit in Las Vegas this week, the Australian software vendor also announced the acquisitions of Good Software – the startup responsible for the Analytics for Confluence add-on. It is the fourth acquisition by Atlassian in the past 12 months, a list that includes AgileCraft (now Jira Align), Butler and OpsGenie. Confluence, created in 2004, is one of Atlassian’s oldest products and its second biggest revenue driver. Initially aimed primarily at software developers, its focus has widened in recent years: Atlassian’s head of Confluence Cloud, Pratima Arora, said that one in four Confluence customers now use the application across their operations. The new features announced this week are aimed at continuing to broaden the appeal of Confluence to HR, marketing, sales and business teams. The biggest change involved improved analytics. Arora pointed to a range of uses. It will be possible, for instance, to gain insights into how individuals and teams are engaging with Confluence content, much like Google Analytics gives feedback on public websites. This can help creators tweak their content (cut sentence length, add more images or change titles) to get more views. It also allows lets managers to check whether team members have actually read important documents, for example. “Creators want to know what is the reach of their content, how many people are reading it, how are people engaging with it – so we give them simple statistics,” said Arora. The company also plans tighter integration with Good Software’s analytics add-ons. There are new ways to interact with Confluence, too. Among these are slash commands to quickly add tables, images, emojis and more to documents, as well as new visual enhancements that can be included. These include: tables of contents, action items, roadmaps, statuses and due data. Smart links automatically add rich previews of third-party apps such as Google Drive, Dropbox, Trello and Asana. Atlassian is also making it easier to find content within Confluence. Updated navigation offers a declutter feature and a more intuitive way to switch between expanded and collapsed menus. There are new people and team profiles – with information such as a bio, photo and recent work – and more accurate quick-search functions. David Chou, vice president and principal analyst at Constellation Research, said the enhancements, especially those involving analytics, will be welcomed by customers. But Atlassian faces challenges in pushing Confluence to a broader enterprise audience and expanding its market share, he said. “I would say they still need to figure out how to get to enterprise clients, number one,” Chou said. “Number two is, because the focus of the people that are using the platform are mostly knowledge workers, programmers, developers, this is not on the radar for the CIO. So when it is not on the radar for the CIO or the exec sponsor, it is hard to really gain that enterprise adoption. Those are some of the challenges, but they recognize that and they are working through that, which is great. Arora said that while demand for Confluence is still strongest in with technology teams, it is growing in the wider enterprise. "We have seen a huge trend in that direction,” she said. “We do still have a very strong hold in dev and IT, because that is where we started. And we want to keep those users – those are our champions, those are the ones that bring Confluence to the entire company sometimes. But we are seeing a lot of growth in other teams – marketing and HR being our top two."